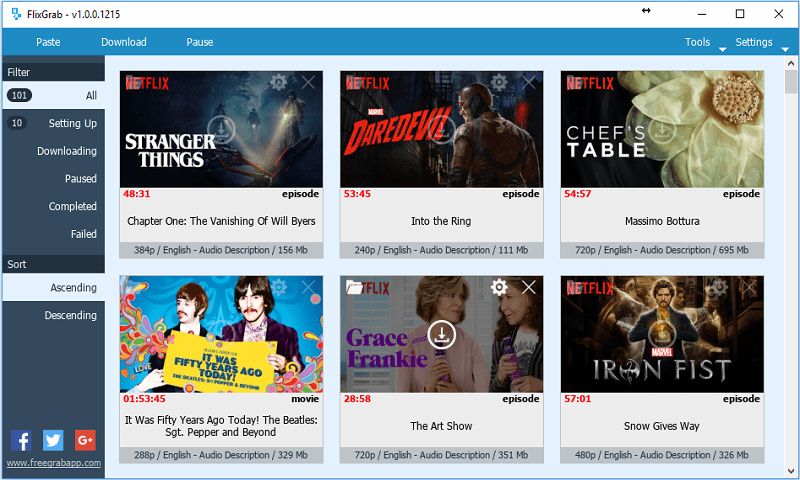 The FreeGrabApp Team has come up with a new app that allows you to download and save entire Netflix serials, TV shows, documentaries, movies, music. You can now download and watch any Netflix video offline on any device without spending internet traffic, and without disturbing Netflix limitations. The app known as “FlixGrab” has a totally new, easy to use and user-friendly interface. Considered as a massive leap forward in technology, FlixGrab allows you to choose the original quality video from Low Quality (240p) up to High Definition (HD – 1080p or 720p). It supports downloading Dolby Digital Surround Audio 5.1. FlixGrab also supports multi-stream downloading, which allows you to download multiple videos simultaneously. It allows automatic selection of the optimal voice quality, language and the bitrate. Besides this, it loads lists from a file and allows you to manage the downloading priority list. You can easily stop and resume the downloading process, select video’s original language, and much more. FlixGrab for Netflix by FreeGrabApp requires entering your Netflix account credentials (login and password). It will not work for you, if you don’t have an active account on Netflix. Once you login in the app, copy any Netflix video URL, paste it on the download bar, and then click the ‘Download’ button. When you start a download, it shows a progress bar with the percentage that indicates how many minutes you need to wait for the download to finish. Once the download is completed, it generates a mini screenshot of the downloaded content. All you need to is click on play to watch it. For more information on ‘FlixGrab’, you can visit FreeGrabApp’s official site.